Long time visitors to Virgo Moon will know how much I appreciate Karen Ovington's beautiful and unusual beads. I was carrying the large brown floral bead featured here at a gem show, trying to find the perfect match for it. A vendor with whom I've done business for many years always helps me select from his huge and ever changing array of gorgeous stone beads. He pointed to this bead amongst the stack of things I was trying to match, he actually touched it, then he asked me what it was, rhyolite perhaps??? I handed it to him and he was astounded to find it weighs practically nothing as it is hollow formed, and he laughed delightedly to discover that it is glass. If something can get his attention you know it is very special indeed! Many, many people have looked at my pieces carefully, then touched Karen's beads and still found themselves unable to identify the material. Often they cannot believe the beads are glass because her finishes are so unusual. 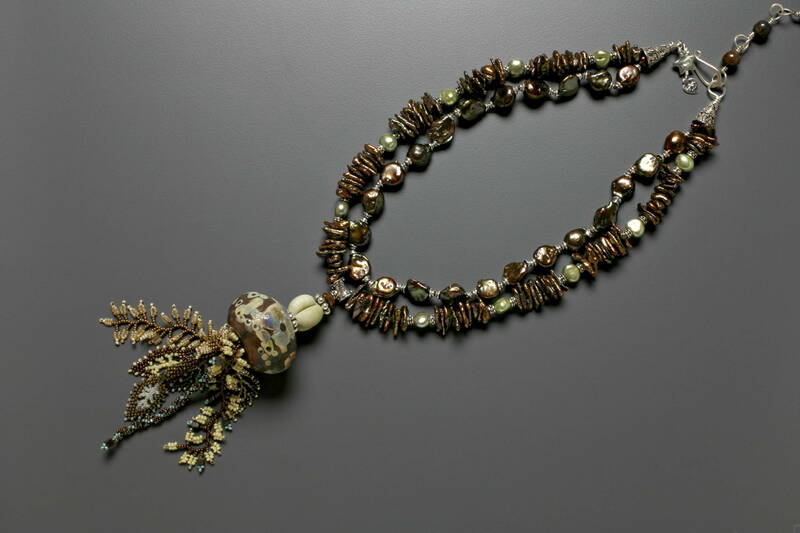 The exquisite beads in this necklace are no exception. 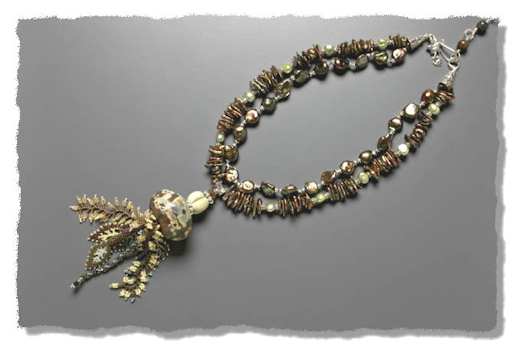 Pearls, seed beads and sterling complement the beads in an autumnal composition. Looking at the photo, you may ask, OK, where's the Pietersite? You can see it in the necklace extension at the back if you hover to see a larger image.. Pietersite is a recently discovered ... Its metaphysical properties are interesting as well. Robert Simmons (see below) mentions it is an excellent aid in interdimensional travel. Naisha Ahsian (also in The Book of Stones) likens its energizing effects to a storm dredging up treasures from the ocean. I hope you will order this delightful piece and enjoy it year 'round!